Philosophy of education is a compulsory course in teacher education in Africa. African scholars have observed that this course is predominantly approached from Western pedagogical perspective hence alienating African students of education. There is lack of African pedagogy responsive to the African context of education as noted by a national commission on education in Kenya. This calls for a search for African pedagogy to instigate paradigm shift from Western pedagogy to Afrocentric pedagogy. Sage Philosophy,a trend in African Philosophy is analyzed in this study in attempt to develop African pedagogy. The method used is philosophical argument based on critical conceptual analysis. 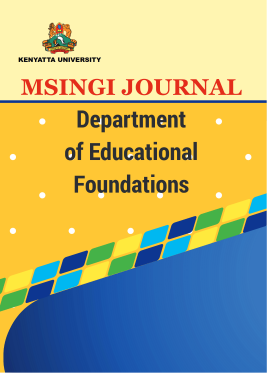 The study findings result in an African pedagogy described as ‘pedagogy of sagacity’ which is proposed as an African approach to philosophy of education. The thesis of this essay is that trends in African philosophy should influence pedagogical theorizing of education in Africa.